Dan Hixson, College of Engineering, University of Utah. University of Utah electrical engineers fabricated the smallest plasma transistors that can withstand high temperatures and ionizing radiation found in a nuclear reactor. Such transistors someday might enable smartphones that take and collect medical X-rays on a battlefield, and devices to measure air quality in real time. "These plasma-based electronics can be used to control and guide robots to conduct tasks inside the nuclear reactor," says Massood Tabib-Azar, a professor of electrical and computer engineering. "Microplasma transistors in a circuit can also control nuclear reactors if something goes wrong, and also could work in the event of nuclear attack." A study of the new transistors by Tabib-Azar and electrical engineering doctoral student Pradeep Pai appears online Thursday, March 20 in the journal IEEE Electron Device Letters, published by the Institute of Electrical and Electronics Engineers. The study was funded by the Defense Advanced Research Projects Agency. Transistors are the workhorses of the electronics industry. They control how electricity flows in devices and act as a switch or gate for electronic signals. Billions of transistors are typically fabricated as individual but connected components on a single computer chip. The most commonly used type of transistor is called a metal oxide semiconductor field effect transistor, or MOSFET. Transistors control the flow of electrical charge through a silicon channel using an electric field to turn the transistor on or off, similar to a valve with the electric field as its control knob and electric charge as its current flow. Silicon-based transistors are a crucial component in modern electronics, but they fail above 550 degrees Fahrenheit -- the temperature at which nuclear reactors typically operate. Plasma-based transistors, which use charged gases or plasma to conduct electricity at extremely high temperatures, are employed currently in light sources, medical instruments and certain displays under direct sunlight (but not plasma TVs, which are different). These microscale devices are about 500 microns long, or roughly the width of five human hairs. They operate at more than 300 volts, requiring special high-voltage sources. Standard electrical outlets in the United States operate at 110 volts. 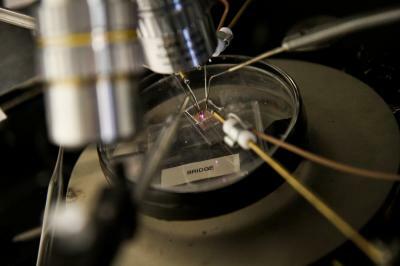 The new devices designed by the University of Utah engineers are the smallest microscale plasma transistors to date. They measure 1 micron to 6 microns in length, or as much as 500 times smaller than current state-of-the-art microplasma devices, and operate at one-sixth the voltage. They also can operate at temperatures up to 1,450 degrees Fahrenheit. Since nuclear radiation ionizes gases into plasma, this extreme environment makes it easier for plasma devices to operate. "Plasmas are great for extreme environments because they are based on gases such as helium, argon and neon that can withstand high temperatures," says Tabib-Azar. "This transistor has the potential to start a new class of electronic devices that are happy to work in a nuclear environment." A conventional transistor is made with two active layers, one on top of the other. Electricity flows through one of the layers, called the channel. The other layer, called the gate, controls current flowing in the channel. If sufficient voltage is applied to the gate, the transistor turns on. For the new study, Tabib-Azar and Pai deposited layers of a metal alloy to form the gate on a 4-inch glass wafer. A layer of silicon then was deposited on top of the gate. Unlike typical transistors, the Utah microplasma transistor "channel" is an air gap that conducts ions and electrons from the plasma once a voltage is applied. To achieve this unique design, the team etched away portions of the silicon film using a chemically reactive gas. This etching process leaves behind cavities and empty spaces to form the transistor's channel and expose the gate underneath. The channel tested in this new study was 2 microns wide and 10 microns long, and helium was used as the plasma source. "Although the length scales are much smaller here, we came up with an innovative way to make these structures three-dimensional," Tabib-Azar says. "We are currently connecting these devices to form logic gates and computing circuits that we will test in our experimental nuclear reactor at the University of Utah, a facility not found in most other universities." 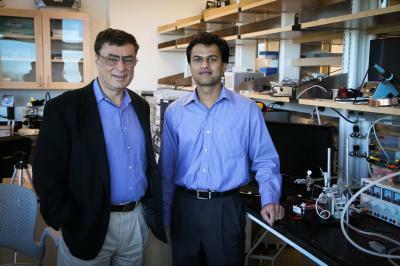 Traditional MOSFETs require metal to connect circuits, says Tabib-Azar, but the Utah microplasma devices will use a plasma-based connection to enable communication. As a result, these circuits will only be operational when powered up and will disappear otherwise, making them suitable for defense applications. These plasma devices could also be used as an X-ray imaging source in the next five years, says Tabib-Azar. Because the device dimensions are so small, X-ray images from a wounded soldier in the field could be collected on a smartphone equipped with transistors that also generate the X-rays, says Tabib-Azar. In another five years, the devices could be used to detect and identify aerosol pollutants based on the color emitted when the substance passes through the device. "These chemical sensing devices could be used to quantitatively monitor air quality in real time and enable researchers to construct an accurate air-quality map," he adds. In the nearer-term, these new transistors could be used to generate X-rays to draw fine lines in silicon to pattern microscale devices for the electronics industry. With this new X-ray technique, Tabib-Azar says, "you can do the same thing you would with laser printing, but instead you can use these tiny X-ray sources to print on a silicon wafer. This gives engineers the ability to do X-ray lithography without having to use very heavy lenses and X-ray beam shaping devices."